To check the availability of the accommodation please use the above calendar, a $ icon shows vacancy and sold means there is no vacancy. Pricing is from $150.00 per night for two guests, additional guests are $40.00 and children 16 and under is $20.00. We have policy of a minimum stay of two nights. Check in is anytime after 1pm, check out time 10:30am. Please Enquire if you need to make arrangements outside of these times or if you would like to book for a single night. We are closed for the winter months June,July & August due to the cold weather, we also start lambing in this period. Health and safety considerations: You are entering a working farm at your own risk, there are multiple hazards, be observant at all times. All care must be taken on the access road to the lighthouse – you may encounter stock and or farm vehicles, horses, working dogs. A 4 x 4 or suv type vehicle is advised however not necessary under normal weather conditions, small town cars with low ground clearance are not recommended. If the access road is wet from heavy rain or you unsure about conditions please check with the landowner. We don’t allow dogs, firearms, motorbikes or the lighting of fires. It is a reserve and we ask that respect and care is taken. A great place to holiday with very experienced hosts. From Blenheim take SH1 southbound for 35km, then turn left onto Marfells Beach Road. Drive for 5.6km, then turn right onto Cape Campbell Road (gravel). Drive 5km to roads end. Cross Cattle stop and enter Cape Campbell Farm, owned and operated by the Peter family since 1973. This final 8km of your journey weaves its way through the working 3,300 acre farm is comprised of cattle and sheep, bearing this in mind there will be a few gates along the way, for you to get out and stretch the legs. Ahead the Cape Campbell Lighthouse rises to meet you. You have reached your destination. *1 1/2 hours drive time from Blenheim. *Theres NO public access through property without prior arrangement. 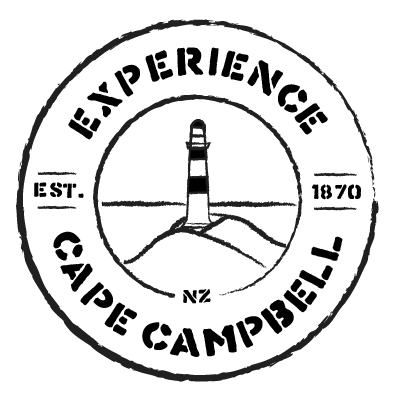 © Copyright Experience Cape Campbell 2019.